When you think of luxury flooring, vinyl probably isn't the first material to come to mind. However, vinyl looks and feels much different than it did in decades past. No longer is it the material associated with garish 1970s kitchens--instead, it has taken on a much more elegant and sophisticated style. Advancements in manufacturing technology and processes have made luxury vinyl an incredibly resilient flooring material. It still has some give to it, making it comfortable to stand on in rooms like kitchens or bathrooms. Additionally, modern printing technology can make vinyl convincingly mimic hardwood or tile in its appearance. Are you ready to explore the potential of this material? 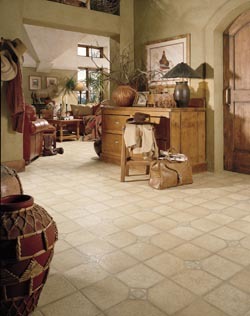 Then visit Flooring America of Scottsdale to view our selection of luxury vinyl tile and plank samples. Our team has expansive knowledge about different brands and styles--with their guidance, you can feel confident in your purchase decision. If you can't decide between two different brands, simply ask one of our sales professionals. They understand the different benefits each brand has to offer and how those benefits can work to address your unique needs. No matter which brand you choose, you can count on our vinyl tile and luxury plank flooring to be comfortable underfoot and to repel moisture. Many homeowners use this type of flooring in bathrooms and kitchens because of its resistance to mold, mildew, and stains. Ask our professionals about the other advantages you can expect with luxury vinyl. Once you make your decision, our luxury vinyl flooring installation team can take care of the rest. These experienced and skilled contractors have completed projects big and small, so no matter what the size of your renovation, they have you covered. When you choose our flooring store for your installation services, we take precise measurements so you don't have to pay for more material than you truly need. Afterwards, we use efficient and effective techniques that ensure the vinyl is placed properly. We're so sure that our installation methods are effective in making your floors last that we offer a lifetime guarantee. We promise that you'll never experience an installation-related problem with your new floors, and if you do, we'll fix it at no charge. Contact us today to learn more about our luxury vinyl flooring products. We proudly serve the communities of Scottsdale, Arizona, including McCormick Ranch, Gainey Ranch, Pinnacle Peak, and Grayhawk.